As fundamentals have changed, especially out of the UK with the 12 month inflation outlook, and technical indicators pointed towards a weaker GBPJPY forex traders decided to realize floating trading profits and closed their long positions. A breakdown below the resistance area as well as the middle band of the Bollinger Band indicator caused a new string of sell orders to enter the market and this currency pair sold off until it reached its support area from where further downside is not expected. 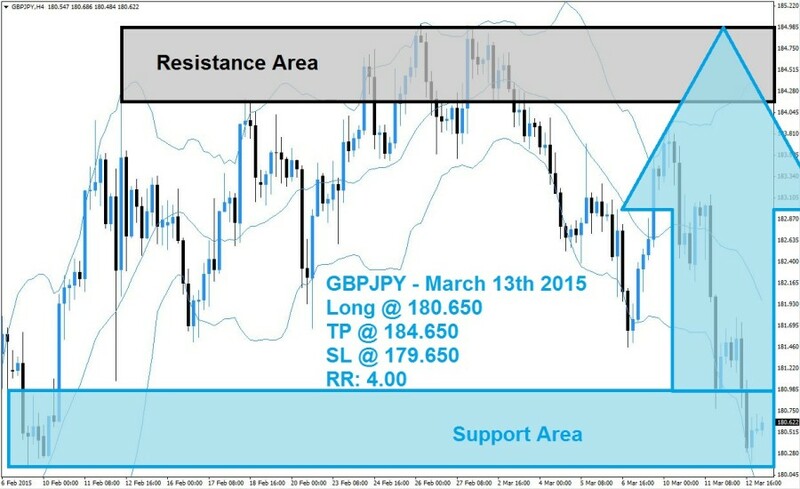 The GBPJPY is likely to be exposed to a short-covering rally from extreme oversold territory and forex traders are advised to seek out long positions at 180.650 and below in order to capitalize from the expected rally. A take profit target of 184.650 is recommended for a potential trading profit of 400 pips on the H4 Chart. A breakout above its support area is expected to ignite the short-covering rally. Forex traders should protect this trade with a stop loss level at 0.7600 for a potential trading loss of 210 pips which will result in a Risk-Reward (RR) ratio of 5.07. EURUSD, GBPUSD trading plan (16-11-2015).